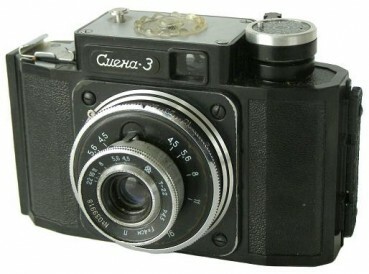 Identical to the model Smena-2, but with redesigned film advance mechanizm. Film speed reminder in DIN/GOST on film advance lever. 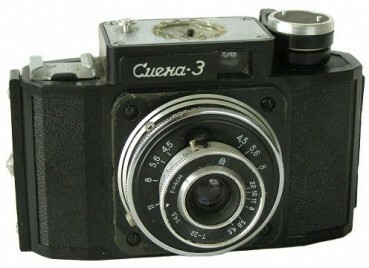 Serial number engraved on closing bar of the case or lens faceplate. Beeing comfortable for user, but very unreliable this camera had very short life. Camera makers came back to well-tried Smena and Smena-2 models. Serial number engraved in white on closing bar of the case or placed on the lens faceplate. All 1st version cameras have film advance lever on the rewind knob. PK2105. 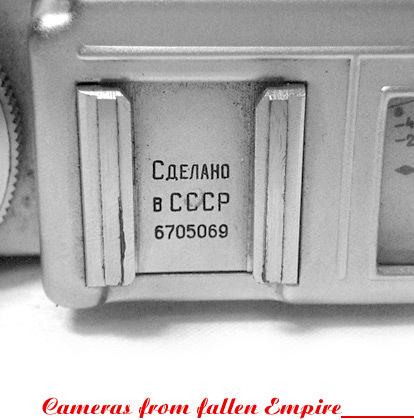 The particular camera comes with serial number on the lens. Name markings in small Cyrillic characters. The double raised platform for name markings (see picture below). PK2110. Another sample from the same group. The camera opposite comes with serial number on the closing bar already. Name markings are bigger size, with no platform already (see picture below).